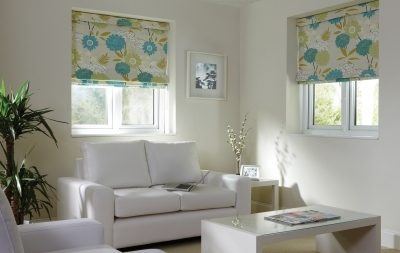 Roman blinds are one of the most stylish ways to dress your window giving a distinctive soft furnishings feel. They are made to fit flat across the width of the window and pull up into folds. Roman blinds can be used as a standalone window treatment outside the window recess or hung inside the recess behind curtains and/or top treatments such as pelmets or valances to give a layered effect. As a bay window treatment, they have a dramatic effect. We have hundreds of fabric options to choose from and can also have roman blinds made up in customer's own fabric. We can create further style and individuality with contrasting borders, braiding, eyelets and shaped bottoms. Most blinds can be made up with cream or white lining, flame retardant, blackout lining or interlining to give a softer more opulent look. Our Luxury Roman Blinds are supplied on with a superior aluminium headrail system with continuous chain operation. We recommend roman blinds to soften and accent your windows, control privacy and light with light filtering or darkening a room with blackout lining. The neat elegant pleated lines of these blinds can offer a minimal contemporary look or a warm classic feel to a more traditional home.